It was hiding in plain sight, of course; it’s just that nobody was looking. The shippers’ eyes were focused on their fermentation lagares and on their blending rooms in Vila Nova de Gaia. The growers’ eyes were focused on the shippers. Underneath their feet was the terroir that made one Port elegant, another muscular, another aromatic. They were aware of it, but they were looking the other way. If you went to the Douro 20 years ago and asked about terroir, the usual reply was that Port was about blending. Yes, altitude and exposure matter – look at the Port vineyard classification, which took those factors into account nearly 70 years ago, and ranked warmer, low-altitude vineyards above those at 500 metres, and steep ones above those with a walkable incline. But soil? It’s all schist, they said, and it’s all the same. The Port demarcation simply outlines a vast area of schist soil. End of story. They didn’t become growers to make table wines but to safeguard their supplies of Port grapes, as sales of Late-Bottled Vintage promised to rocket. Then, because they foresaw labour shortages in the Douro, they also wanted to mechanise. To mechanise their terraced vineyards they had to plant them differently, and to do that they had to understand what was in them. Those terraced vineyards housed dozens of interplanted grape varieties, some identified, some not. Terroir, if anyone had considered the matter, would have been impossibly entangled with grape mix. Every vineyard had a different field blend: how could you possibly say which differences in the wine were down to vines and which to terroir? First you had to evaluate the grape varieties: only then could you consider the terroir. The work on grape varieties reduced the ideal Port vineyard to just five, planted in blocks. And it raised the average (though not the top) quality of Port. But Port grapes need exuberant colour, tannin, aroma and flavour. A bit of overripeness doesn’t matter for Port: extraction is short and sharp, and a few raisined grapes won’t show in the final blend. For table wine it’s a different matter. Schist can be impenetrable too, if the strata are horizontal. But horizontal is not a word that springs much to mind in the Douro: the strata are folded and nearly vertical. The roots can force their way between the layers – and with less than 1.5% organic matter in the soil, the roots have to go well down to survive dry summers and freezing winters. When producers started dipping their toes into table wine, the results were mixed. ‘The wines we used to serve were indescribable’, says Symington now of his early efforts. ‘In 1998 and ’89 we started taking it seriously. About 15 years ago I thought we’d have to plant Cabernet Sauvignon here [for table wines]. I saw raisined fruit, and wondered, how can we make something beautiful? Today’s table wines have silky tannins and aromas of blackberry, juniper and cistus wrapped around a firm black-fruited core, with alcohol in balance and oak pulled back. To make wines like these, from vineyards intended to give maximum colour and tannin, meant first looking at altitude. Everybody loves granite now. Quinta do Vale Meão, in the Douro Superior, has lots of it. Says oenologist Xito Olazabal: ‘You can actually make good wines for Port from granite, especially white. But it’s less concentrated. We decided two years ago to make a single-vineyard Touriga Nacional from 100% granite [Monte Meão]: the wines have too much personality to blend with other wines. Granite gives different tannins and structure, more like Dão,’ whose terroir is mainly granite. Vale Meão has alluvial sand, schist, granite and gravel all rubbing shoulders: it’s very different to the Cima Corgo, where most top Port comes from. It’s also much hotter and drier. Irrigation is necessary, and it’s proving more useful for table wines than for Port. The Cima Corgo, steeper, contoured with terraces, and itself hotter and drier than the Baixa Corgo, the source of most basic Port, now gives both table wines and Port. 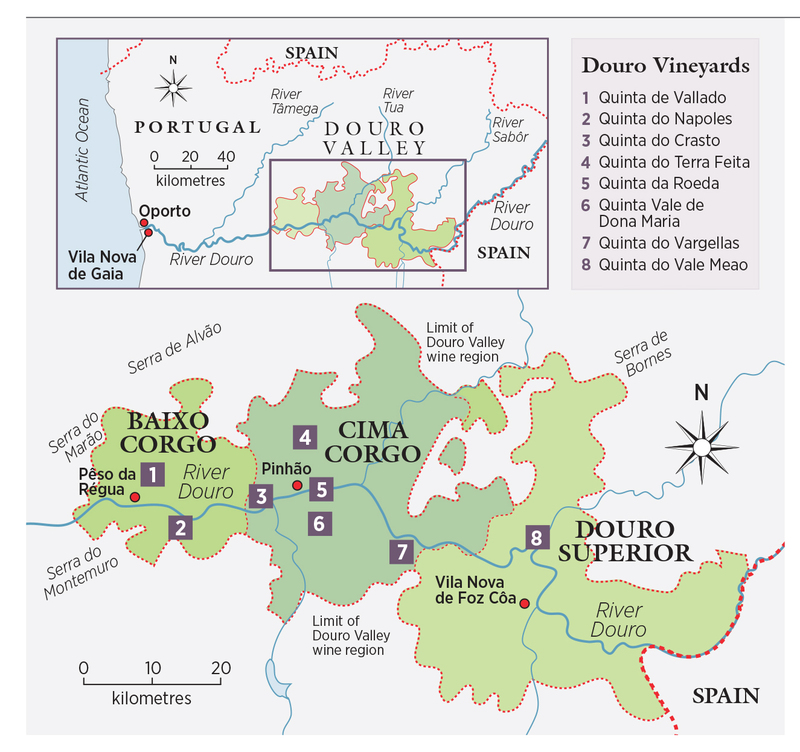 Which leads to an obvious question: are we seeing a separation of the Douro into different areas for Port and table wine? The answer is: up to a point. But it’s complicated. Quite often the sites rated less highly for Port are better for table wines, and altitude can be a big part of this. Exposure is also important, and you can hardly get two consecutive metres of vineyard with the same exposure. For Port, you might wantsouth- or west-facing vines; for table wines, often north-facing, or at least with some afternoon shade. But it’s not yet possible to draw lines in the map to say, ‘here is Port, here is table wine’. It can only be done vineyard by vineyard, even parcel by parcel. And the more you look, the more you can see.